Authored by 43 international experts, the objective of The Quran: An Encyclopedia is to present this diversity of thought, approach and school in order to give a strong appreciation of the range of response that the text has provoked throughout its history. It provides students and researchers with a powerful resource covering all aspects of the text and its reception. Technical terms are explained in the text itself and the style of each entry is designed to be as self-contained as possible. Entries are cross-referenced and many include a brief bibliography. 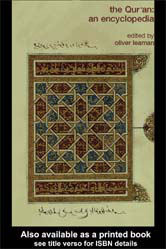 At the end of the work there is a substantial annotated bibliography providing a detailed guide to the most significant books, journals and articles in Quranic studies.